DCM is listening to your feedback! Well, we have about 100 more surveys and more suggestions. We are currently working on adjusting and adding to the DCM. In September we will have two new exhibit areas and special themed Saturdays. Look for more details on our website. If you have any feedback of your own, please contact me via email at jjohnson@sciencedetroit.org. The rest of this month we will be celebrating the Dog Days of Summer. Come down and join us for some “doggy” good fun. What Do Dogs and Cars Have in Common? The Detroit Children's Museum, where we'll be celebrating both all week long! Aug. 16-21: It's the Dog Days of Summer and we'll be highlighting the Dog Stars, doggy crafts and a special workshop on Saturday, Aug. 21, on learning to draw a cartoon dog. Aug. 19-21: It's Future Cruisin' over at the Detroit Science Center and here at the Children's Museum we'll be doing Classic Car Match Up, Crafty Cars and Truck Rally activities. 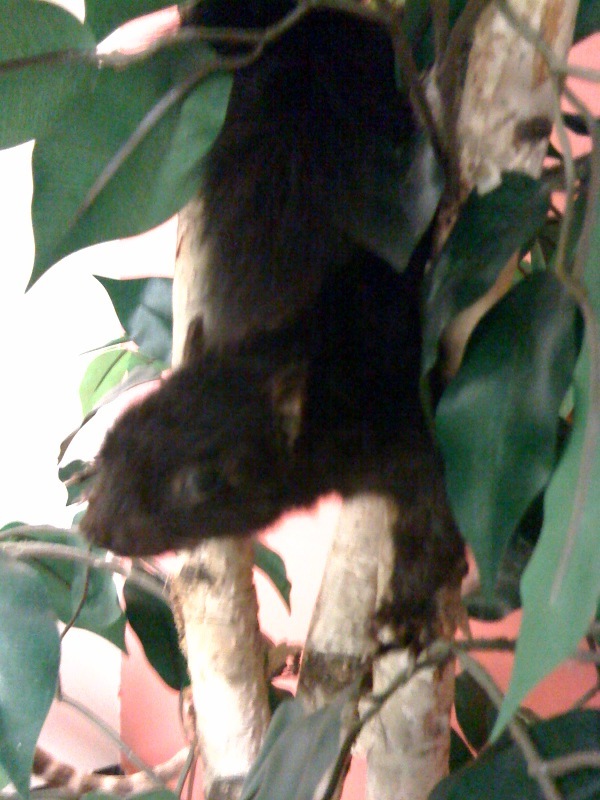 Meet the newest DCM staff member! Sheldon is our newest staff member--an adult Russian Tortoise. He came to us from the Every Animal Rescue League. We are very happy that he is now a part of our team. He loves to look at you from his tank. When no one is looking, he takes walks with our staff just to make sure that everything is where it should be. 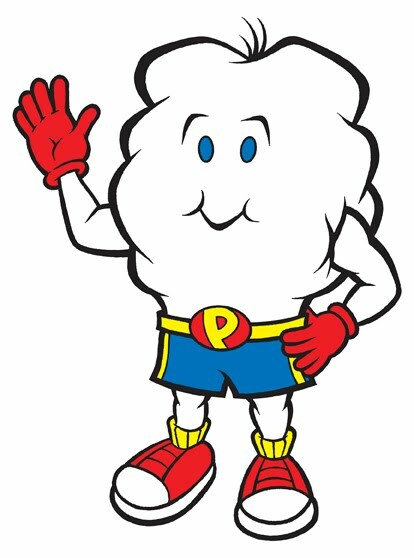 Come down and say hello--I'm sure he'll be happy to meet you! We have also added a new hands-on exhibit called "Silverbold Gold & Silver Mine." Try your hand at finding gold or silver nuggets from our kid-friendly mine. Kids receive a special prize for finding the nuggets. Just present them to the front desk staff to redeem your nuggets for a prize. Wow! What a wonderful weekend with our visitors at the DCM. We had 164 visitors this past Saturday. We eagerly read the surveys and are trying to incorporate some of the suggestions you made. We are busy improving and expanding the exhibits this week. We can't wait to share the latest changes and updates when we open at the end of June. The past 2 months have flown by as we prepare to open the Children's Museum. We have worked on so many different things from behind-the-scenes chaos of computers, phones, and security systems, to hiring staff and making sure the building is clean, safe, and inviting. 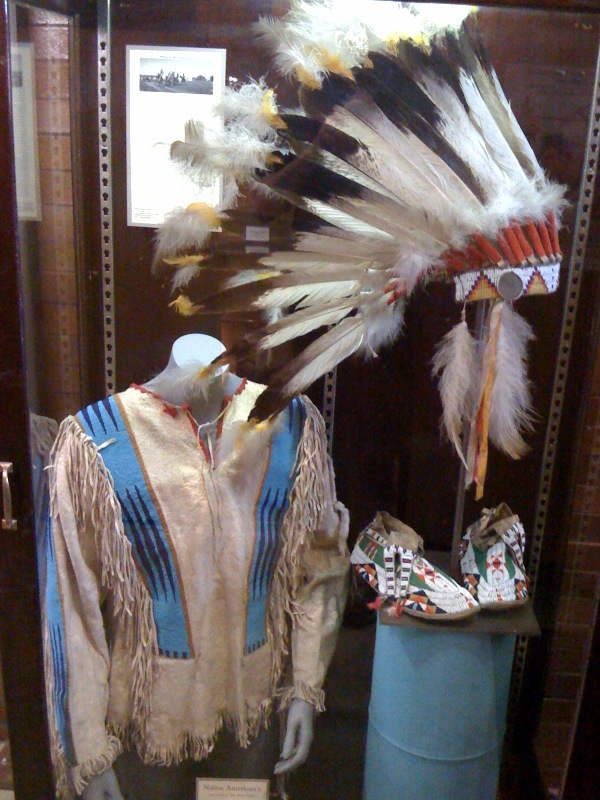 We have also been busy removing artifacts that had been in the cases since last summer, searching the collection to bring out pieces that may bring memories of years ago, reinstalling Silverbolt, moving cases, working with teachers on the lending collection for their multicultural days to adding donated displays and so much more. None of this would be possible without the help of the entire DCM staff and a little help from our friends at the Science Center. They are awesome! We are working feverishly to finalize the remaining areas of the Children's Museum that were not quite finished at this last open house. We can't wait to show off all of the wonderful artifacts, hands-on activities, new planetarium shows and programs. Thanks to all of you who have taken the time to visit the DCM at our Open Houses this spring. We hope to see all of you this summer. In the land of the five-year-old boy, the dinosaur is king. And so my son Hayden and I set off to the Detroit Children’s Museum community open house last Saturday in search of the prehistoric creatures that never fail to captivate and delight. Upon entering, the first exhibit we encountered was an Andrewsarchus skull. Cool, but not a dinosaur. Next we stopped to look at the model houses (“Look mom, they’re eating pizza!”), ancient masks and Civil War relics. Also cool…but still not a dinosaur. Finally we turned the corner and found the one object that was a “must see” on this trip – a model of Triceratops, or a “three horn” for all you parents who have suffered through that series of dinosaur movies that must not be named. We also found some nice displays with dinosaur pictures, and the leg bones of a dinosaur and a mammoth. Amazingly all dinos were forgotten once Hayden caught sight of Champ the Tiger. While Champ is a “no touch” exhibit, there was a nearby display of animal pelts that the kids could feel, including skunk fur (“yuck!”), and an educational board that showed us which animals have fur, feathers, skin or scales. The animal theme continued as Hayden joined a group of other kids building a zoo using blocks and toy animals. And in the puppet theater, Hayden got to be an elephant, one of his favorites. All animals aside, we also got to look at crystals and rocks under a magnifying glass. Hayden insisted that the red rock must be from a volcano, of which there was a model nearby. We also looked at books together and checked out the computer stations. After an hour-and-a-half, we never did make it to the art area, but we have to save something for next time, right? 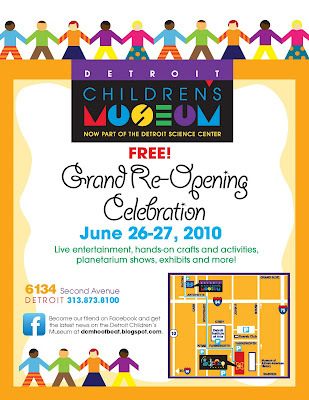 And there definitely will be a next time, because in the next few weeks leading up to its June 26 grand re-opening, the Detroit Children’s Museum will be bringing out more artifacts, creating more hands-on activities and guess what? Adding more dinosaurs! 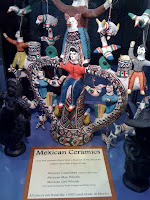 And every few months, they’ll bring out more new things for us to see from their collection of over 100,000 artifacts. So while we started out in search of dinosaurs, we found so much more…and we can’t wait to see what’s next. 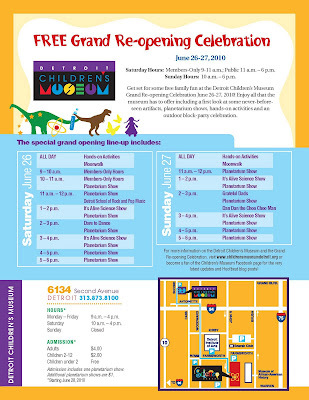 Detroit Children's Museum Grand Re-Opening Celebration is June 26-27! Save the Date! How far is the Children's Museum from the Detroit Science Center? Thanks to all our wonderful visitors and loyal followers of our blog. We have been very busy this past week or so rearranging, fixing, and setting up new gallery spaces. We have removed all of the artifacts in the cases in the main gallery and are cleaning and repairing any fixtures etc that need it. We are bringing out of storage some dioramas to place on the main floor which needs some ‘tender loving care’ from our exhibit shop before they will be open for viewing. We will be adding several more pieces soon and hope to have most of the display cases filled in time for our next Open House for May 22. We have also been working very hard on the latest requests from schools regarding our lending collection. This is very exciting as we get to see the students enjoy the artifacts at their schools. We are looking forward to extending this out to all schools in the area. A huge thank you to all the visitors that came to the Detroit Children's Museum on April 24. We had a wonderful day with planetarium shows of the Night Sky, seltzer rocket demonstrations, solar system bracelets, exhibit exploration and hands-on fun. It was great to see over 100 visitors at the museum. This week we are getting ready to make major changes to the exhibits on display. We will be removing some of the current exhibits for ones that haven't been on display for quite a while. We will also be rearranging the current areas to incorporate as much of the floor space for our visitors enjoyment as possible. We are looking forward to our next Open House on Saturday May 22. Hope to see you there. 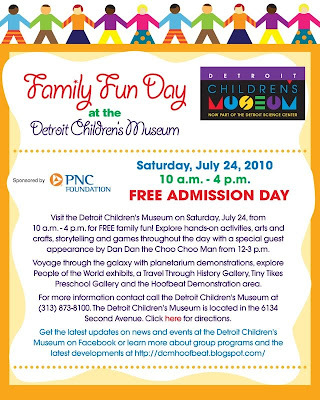 This Saturday: Preview the Detroit Children's Museum before it reopens! "Hello all. Wow! There are so many changes occurring at the DCM. Silverbolt is back in front of the building and is all spruced up. He looks great. I would like to thank all of our visitors for stopping by on March 21 for our first Open House. We had over 100 people stop by to take a sneak peak. Our next Open House is this weekend Saturday April 24 from 11-3. 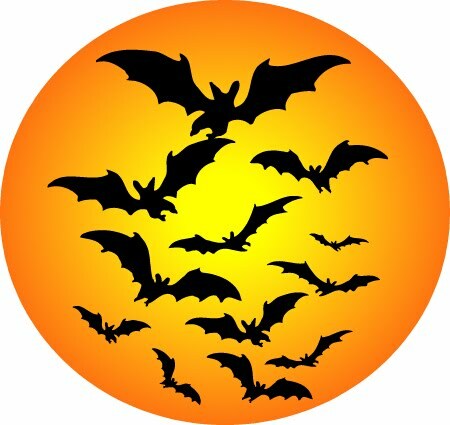 We will have our planetarium open with a night sky show. We will also have two hands-on activities specifically for space science Seltzer Rockets and Solar Bead Bracelets. 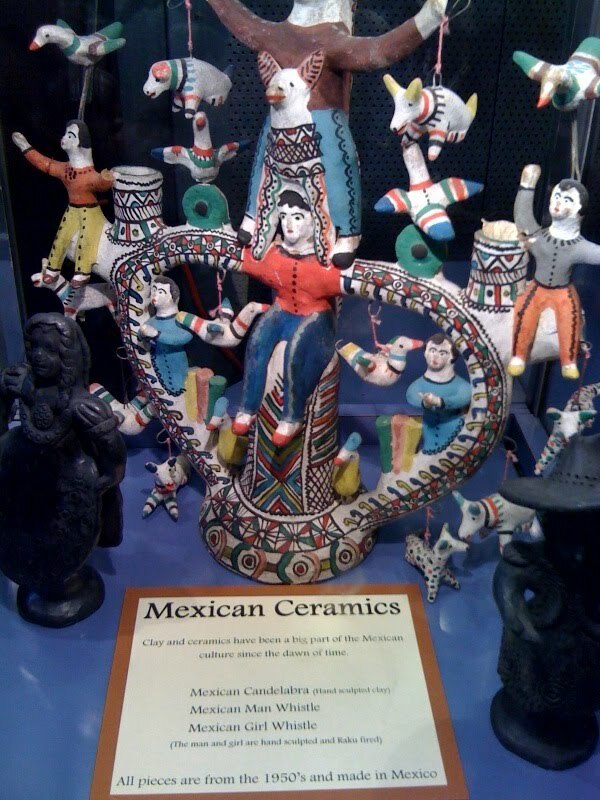 Of course our exhibits will be there along with our regular hands-on activities. We are looking forward to sharing this with you. Hope to see you there! Over the past week or so we have been busy inventorying all of the artifacts and equipment, getting behind the scenes operations up and running and getting all of our programs ready for the summer and fall. This is an exciting time for our staff as we try to incorporate all the ideas we have. If you have any ideas of what you would like to see. Let us know. We'd love to hear them. Thanks for all of your support." The iconic, giant silver horse that is synonymous with the Detroit Children's Museum is back! He was removed from the front of the building for some repairs, but now Silverbolt is where he belongs! Stop by and visit with him - and send pictures! We'll post them here! This past week has been very exciting. 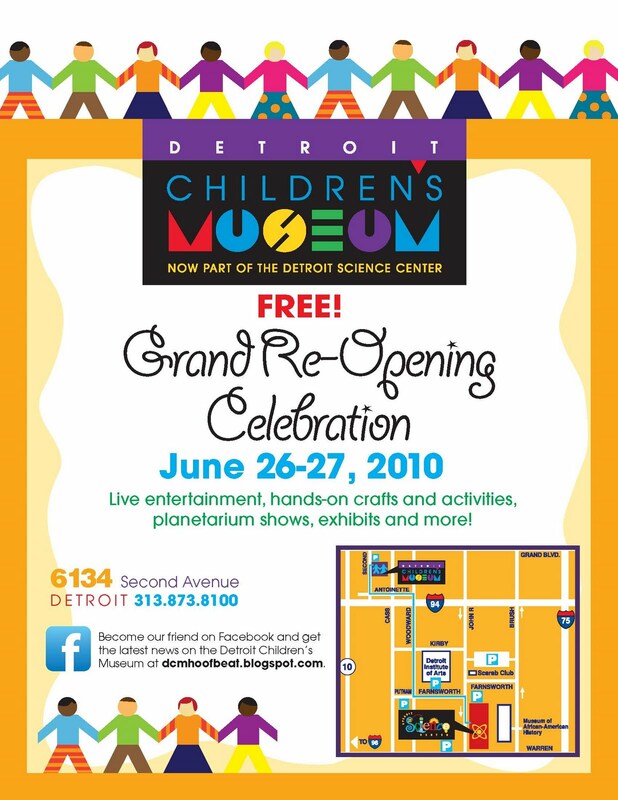 I have been planning our 3 open houses for the the Detroit Children's Museum and our Grand Opening. I have several groups signed up for entertainment for the Grand Opening in June and we are on our way getting organized for our summer programs for families and children. I am in the process of recruiting volunteers for the DCM. If you are interested in volunteering and are over the age of 16 please go to the Detroit Science Center website and check out our volunteer programs. Our Open Houses will be March 21, April 24, and May 22 from 11am-3pm. You will receive free admission to the Children's Museum and be able to explore our exhibits, speak to staff about changes, and see our plans for our new exhibits. We are looking forward to seeing you this spring. BTW-Some of you have asked if "Silverbolt" the horse is still at DCM. Yes, he will be back once we open. It is with great pleasure that I am writing to you about re-opening the Detroit Children's Museum. 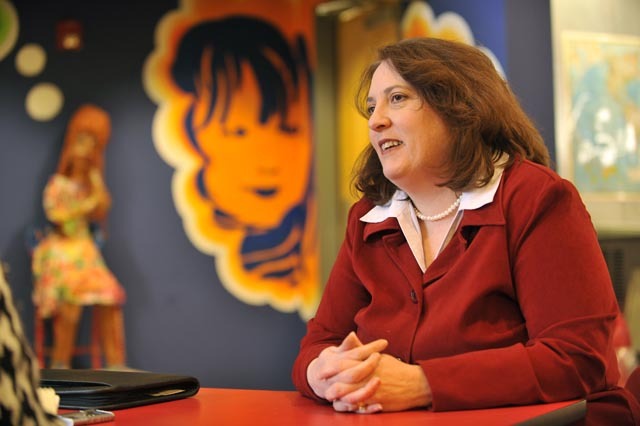 I am Julie Johnson, the new Director of the Detroit Children's Museum. For that last few weeks I have been working with a wonderful team at DPS as we complete the process of transitioning the Children's Museum building from DPS to the Detroit Science Center. I was in the building yesterday eager to get started on this journey. I have many plans and hopes for the building, the exhibits and most of all the students and their families of Detroit. There are so many wonderful artifacts, hands-on activities and programs that we are preparing for this summer. Of course, there are many wonderful favorites that you will still be able to experience including the planetarium and many of the favorite exhibits and hands-on activities. I can't wait to share them with you in up-coming blog entries. We will be holding 3 open house days in the coming months with the first one in March. I hope that some of you will stop by and see where we are and our plans for the future. We are scheduling our Grand Re-opening for this summer. 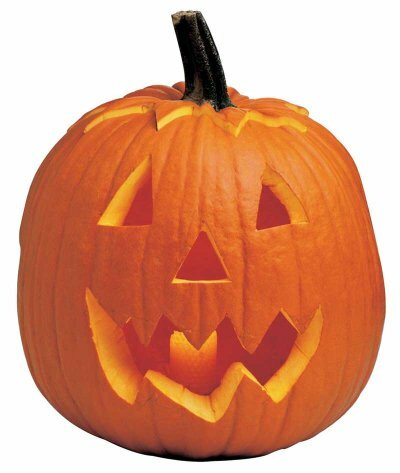 We are making plans for a huge celebration with many local artists and groups. I hope to see you there. 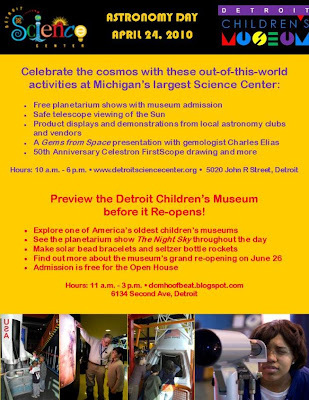 Please check the Detroit Science Center website and this blog for more details as we progress.